Ohio State is 3–0 all-time against against Maryland and is 1–0 as the home team. Ohio State played Maryland, the Buckeyes won 62-3. OSU played a season without playing Maryland was 2013. The Scarlet and Gray lost to Maryland was...never. Ohio State played game 6 in Columbus was 2015. The No. 1 Buckeyes defeated Maryland with a 49-28. The Buckeyes lost a game 6 home tilt was October, 14 2000. No. 5 Ohio State lost to unranked Minnesota 45-15. When the university was searching for a new coach after the 2000 season, many people used this game in support of Glen Mason to receive the job. OSU lost to a non-conference opponent in game 6 was in 1927 against Princeton. The Tigers won 20-0 in Palmer Stadium (NJ). Bowl Game: Lost to Boston College 30-36 in the Quick Lane Bowl. Coaching Status: DJ Durkin (6–7) 2nd season. QB Perry Hills graduated after the 2016 season. He broke Maryland's single-game rushing record for a quarterback when he ran for 170 yards against Ohio State in 2015. Last season, Hills threw for 1,464 yards, 12 touchdowns and completed 61.9 percent of his passes. WR Teldrick Morgan led the team with 43 receptions and was second on the team with 497 receiving yards. DB Alvin Hill led the team with two interceptions and was fourth in tackles (51). This is the 17th time the Buckeyes have played on October 7th. No. 1 Ohio State defeated Bowling Green 35-7 in Ohio Stadium the last time the program played on this date. 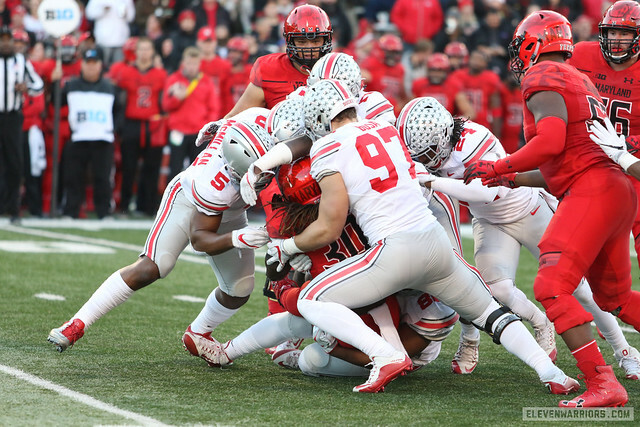 The Buckeyes are 15–1–1 when facing unranked opponents on October 7th. This will be Ohio State's 13th home game on this date. The first game the Buckeyes played on October 7th was a 28-0 defeat of Wittenberg in 1899 at Ohio Field. Ohio State is 94–30–1 in the sixth game of the season and is 60–18–1 when playing the sixth game in Columbus. DJ Durkin finished his first season at Maryland with a 6–7 overall record and was 3–6 in the Big Ten. The Maryland football program has never defeated the following Big Ten teams: Illinois (0–0), Nebraska (0–1), Northwestern (0–0), Ohio State (0–3), and Wisconsin (0–2). Over the last ten years, the Buckeyes are 9–1 in the sixth game of the year. The loss was to No. 14 Nebraska in 2011.